Who doesn't want to smash the rack wide open the way the pros do on TV? You don't need to be a professional to have an effective break. An effective break means maximizing the energy in the cue ball and spreading the object balls widely. Having the proper equipment, like a Break cue, is definitely a good start but even more important is having the right training and the proper technique! 1.) Make sure the balls are racked tightly. Take your favorite rack and try to freeze as many balls to one another as you can. 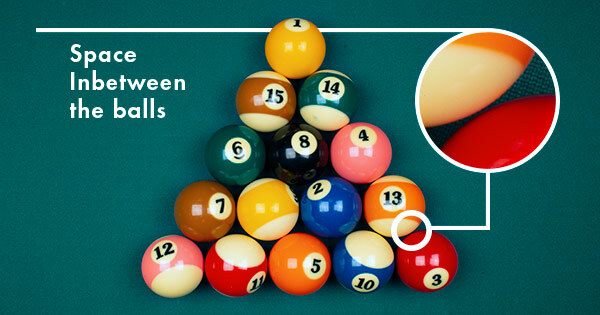 If a large cluster of balls remains together after your break, the rack may not have been perfectly tight. If you're playing at a place that has mismatched balls, try putting the odd ones in the back row. 2.) Timing and accuracy always beat power. It's more effective to contact the rack squarely than to hit the balls as hard as you can. 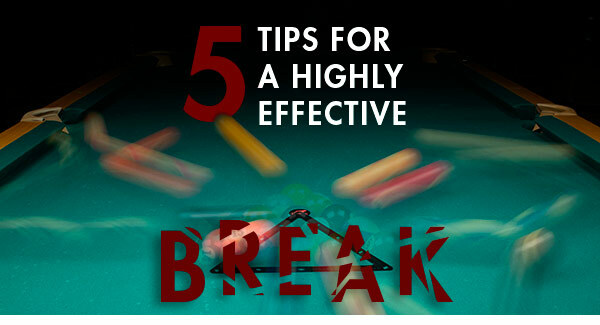 The ideal break moves the cue ball very little after impact and explodes the racked balls, so make adjustments if you need to. 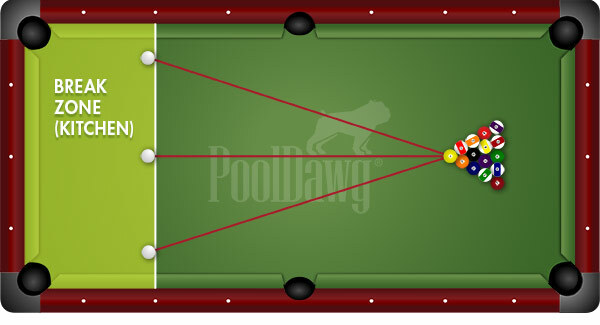 If the cue ball is going forward after you contact the rack, aim a little lower on the cue ball. If it's moving off to the right, aim more to the left of the head ball. 3.) Choose your break spot. Choose your break spot and aim from the cueball through the center of the head ball. If you're breaking from dead center, then you would aim for the center of the head ball. If you're aiming from the side, your contact point also moves to the side. Draw a line from the center of the cue ball through the center of the head ball to find your contact point. 4.) Lock in your alignment. Lock in your alignment and keep your eyes on the cueball. As we increase our speed, we don't always contact the cue ball where we're aiming, especially if we drop our elbow during the final follow through. Looking at the cueball all the way through your break stroke will help ensure you make contact where you want. 5.) Stand up a little higher. Stand up a little higher to allow your arm to follow through a little more. Develop your accuracy before increasing your speed, and definitely before involving your body weight. Sometimes our body inhibits us from following through more. Standing up higher will help eliminate this problem. Stay loose and fluid. Developing a power break like the ones we see on TV takes more than just a few leisure games a week. It takes years of practice and fine tuning. However, keeping these tips in mind can help spread the balls out more and make the game more enjoyable. 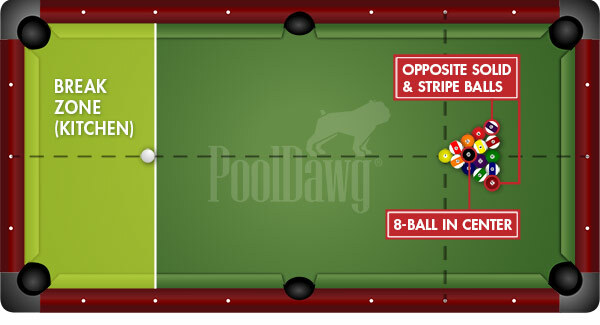 The 8 ball goes in the center and opposite stripe and solid balls go in the back two corners. 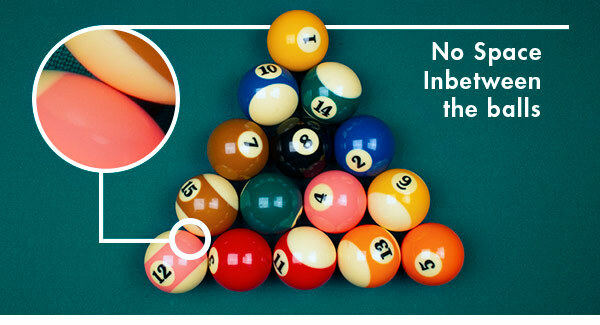 8-Ball Racking Rules: Center the lead ball two diamonds from the end with the 8-ball in the middle of the 3rd row. You must have a solid ball on one corner and a stripe on the other corner at the base of the rack. The 1 ball goes in the front and the 9 ball goes in the center. In both cases, all the other balls should be placed randomly. 9-Ball Racking Rules: Center the One-Ball two diamonds from the end of the table and put the 9-Ball in the middle. All other balls are placed at random.